Mention of wood rasps has been increasing in recent years as more come to recognise their value as a high-quality tool rather than a blunt instrument. Several manufacturers have come to the fore, recognised as producers of the best quality now available, but sadly none are British. Auriou in France are one of these and this set of six double-ended rifflers - available in 150, 175, 200 and 250mm lengths - represent the best around. With 12 different profiles to work with, these will cope with almost any difficult situation where you want to remove material and they are capable of leaving a fine finish. The 150mm set are 'Grain 14', which is the finest they produce while the 250mm are 'Grain 10', which is still reasonably fine. The prices reflect the quality and the above sets cost between Â£285-Â£319.99, so you need a definite commitment to invest but they are also available individually if you have a very specific need. 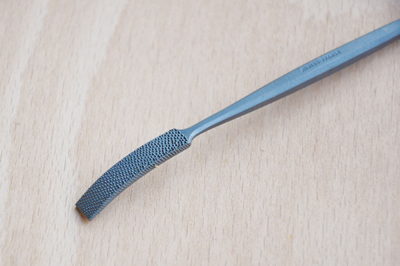 Beware of cheap machine-stitched rasps: one supplier offers a set of eight double-ended rifflers for under Â£15 and with these tools cost really does have a significant correlation with performance. Auriou rifflers are ideal for carvers, model makers and anyone working with unusual shapes where other tools might not reach.